Image showing instabilities along the edge of a cloud of material exploding from the sun. Huge clouds of material erupting from the sun may share at least one feature with the fluffy white clouds scudding through Earth's skies — ripples along their edges. 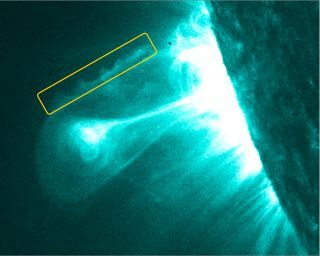 Researchers studying new images of coronal mass ejections (CMEs) — massive eruptions of material and energy from the sun — have spotted ripples of instability along their flanks similar to those seen on the edges of Earth's clouds, or in ocean waves. The results could help scientists better understand and predict CMEs, and perhaps other aspects of space weather, researchers said. "This new observation may give us a novel insight into why these CMEs appear to both rotate, and be deflected away from following a simple straight path from the surface of the sun," said study lead author Claire Foullon, of the University of Warwick in the United Kingdom, in a statement. "If the instabilities form on just one flank, they may increase drag on one side of the CME, causing it to move slower than the rest of the CME." Foullon and her colleagues studied images obtained by the Atmospheric Imaging Assembly instrument on NASA's Solar Dynamics Observatory. SDO, which launched last year and orbits around the Earth, peers deep within the sun's layers, helping scientists better understand how solar storms evolve and erupt. The new SDO observations provided images of CMEs at 19.8 million degrees Fahrenheit (11 million degrees Celsius) — a temperature that was not possible to observe using previous instruments, researchers said. On examining these pictures, the scientists spotted a familiar pattern of instability on one flank of an exploding cloud of solar material. The pattern closely paralleled phenomena — known as Kelvin-Helmholtz (or KH) instabilities — seen in Earth's clouds and ocean waves. KH instabilities appear to roll up into growing whirls at boundaries between things moving at different speeds — for example, the transition between air and water or cloud. The difference in speeds produces the boundary instabilities. Similar conditions can occur along the path of a CME, as it travels through the sun's corona, or plasma "atmosphere." Differences in speed and energies between the CME and material in the corona can create KH instabilities similar to those seen in Earth's clouds, researchers said. While scientists have inferred the presence of solar KH instabilities before, this is the first time they have been directly observed in the corona, researchers said. The new results — reported recently in the Astrophysical Journal Letters — also suggest that the instabilities appear to form and build on one edge of the CME, researchers said. This may explain why CMEs seem to bend and twist: As the instabilities build, they cause drag on one side of the cloud. "The fact that we now know that these KH instabilities in CMEs are so far only observable in the extreme ultraviolet, at a temperature of 11 million Kelvin [19.8 million degrees Fahrenheit], will also help us in modeling CME behavior," Foullon said.